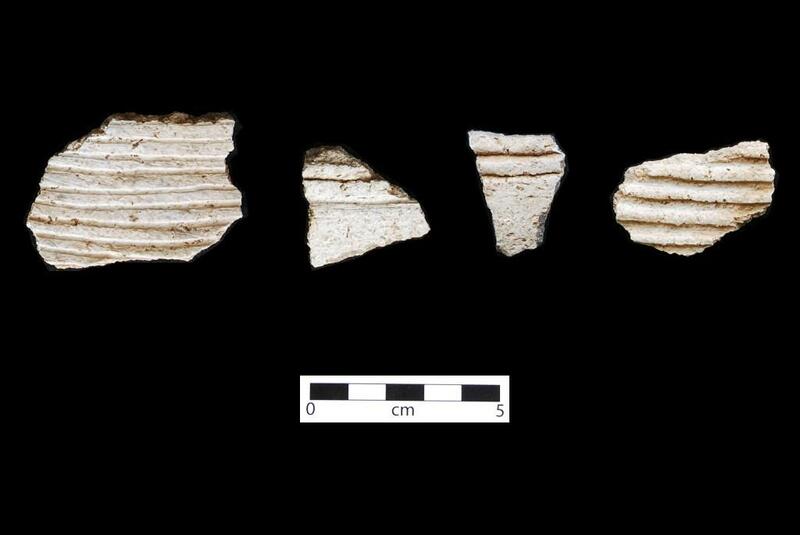 Coconino Gray sherds. Click the image to open the Coconino Gray gallery. Coconino Gray is a type of Tusayan Gray Ware found across the greater part of northern Arizona and southern Utah. Date Range: Kayenta Heartland: A.D. 950-1100 (Christenson 1994), Flagstaff Area: A.D. 1025-1075 (per Christian Downum, Northern Arizona University). Temper: Abundant medium-fine to coarse quartz sand; occasionally some feldspar; conspicuous on both surfaces. Surface Finish: Very rough; scraped; not smoothed; not polished; often deeply pitted; scraping marks conspicuous; neck coils unobliterated on exterior surfaces, emphasized by horizontal tooling marks creating channels of roughly semi-circular section and producing fluted effect; coils vary from 1.5 to 6 mm in width; body and base plain. Vessel Thickness: 2.9 to 6 mm; average 4.3 mm. Decoration: No painted decoration; neck coils unobliterated and tooled. Comparisons: Lino Gray, Kana’a Gray, and Medicine Gray are never tooled; body and base sherds are indistinguishable. Honani Tooled necks are decorated with linear tooling marks in series; body and base sherds are indistinguishable. O’Leary Tooled necks are decorated with indentations or punching without tooled channels; body and base sherds are indistinguishable. Kiet Siel Gray usually has coarser temper with small quantities of opaque angular fragments, less well-smoothed surfaces (usually bumpy), coils that are generally not quite obliterated, and thicker vessel walls.